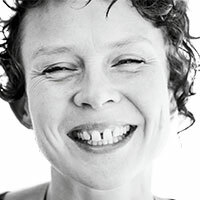 Ruby May is a creative visionary and facilitator of transformative spaces – workshops,rituals and gatherings – that support the emergence of a new culture of embodied, heartcentred living, authentic expression, permission and playfulness. After a decade of exploring how we bring more consciousness into the way we relate intimately, Ruby’s current research is centred around what a balanced ntegration of the Feminine and Masculine might look and feel like within us, our relationships and our organisations, and how the embodiment of this might be a vehicle for systemic change. Studying the physiology of the female body has been instrumental in learning about what particular qualities Feminine leadership has to offer the world. In my work I am passionate about supporting the creative evolution of humanity and technology is of course one of our most exciting and powerful areas of rapid evolution. And nowhere perhaps as important to ask ourselves big questions: what are our guiding principles in the choices we make as we create? What are we in service to? What are our collective fears and shadows that run the risk of sabotaging our dreams? A reclamation of feminine wisdom and leadership in guiding the evolution of technology towards being in service to creating more balance and integrity in the world.